Stick around on Sunday for the Smilin Pumpkin activities that start at 1:00 at Camp Drake. The 2013 Pack 42 den meetings kick off next Tuesday (9/3) from 6:30-7:30 at the Homer United Methodist Church. All of the dens will be meeting. If you have soccer or baseball practice, just come when you can. This Saturday we are holding two back-to-back events at Camp Drake. 6:00pm: Crossover ceremony for all Cub Scouts, new and old. 7:00pm: Campfire w/ hot dogs, s’mores, songs, and more. Later: Overnight camping for those interested. You should have received an Evite for the campfire. Please respond and add a comment if you plan to spend the night. We will decide Saturday morning whether or not the campfire and camping will take place (in case it looks like rain). The crossover will happen rain or shine. 7:00pm – 7:30pm: Test runs. Bring your car and give it a couple of test runs and double-check the weight. All activities will be at the Homer Elementary School in the Old Gym. The Pack 42 Pinewood Derby is coming up faster than you think! It’s just 3 1/2 weeks away (March 23). You should already have received your car (and assigned car number) from the pack. If you have not, please contact Gloria. Adventure Camp at Camp Drake is just around the corner. This year, Pack 42 will be attending the Gold Session from July 22-25. This is a three-night (Sunday-Wednesday) camping experience for our Webelos at Camp Drake. It involves three days of outdoor activities to keep your boys busy and having fun. There are also lots of chances to earn awards during this trip. The Webelos that went last year earned 4 activity pins in just three days! The flyer is attached to this e-mail. During camp, there will always be two leaders with the boys. If you would like to spend a portion (or all) of the time at camp, please let me know. If we have more than two adults, we have more flexibility in what we do. Currently, I am the only adult who has committed to going to camp. If you would like your son to attend, the registration deadline is June 25. To register, you just need to give me a check made out to “Pack 42.” for $130. If you would like to use your son’s scout account, I can let you know the difference. Additionally, each scout must have a fully completed health form to attend camp. This is also attached. Sections A, B, and C of this form needs to be given to me when you arrive at camp in July. This health form requires a doctor’s visit, so don’t delay in getting it filled out. Adults – you also need to have a physical to complete the form. DON’T DELAY IN SCHEDULING YOUR DOCTOR’S VISIT! Please don’t hesitate to call or e-mail me if you have any questions about camp. 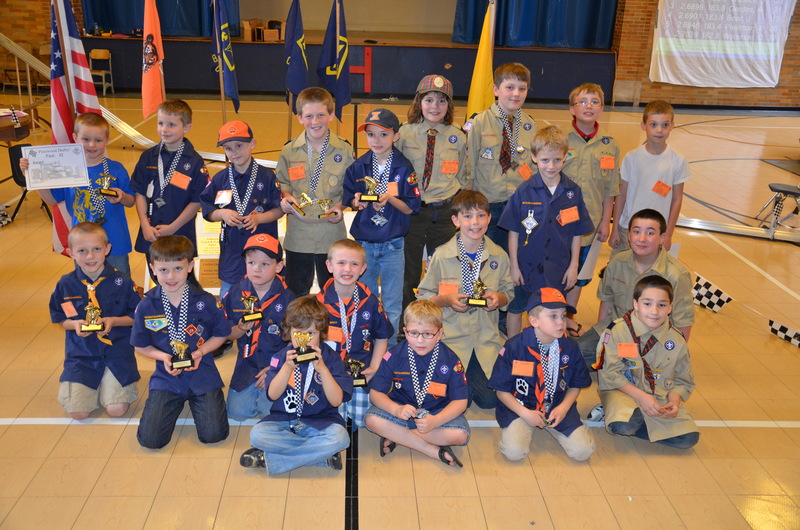 This PDF file has the results for all of the Pinewood Derby races last weekend. Good job to all of the boys. We had some really fast cars. All of the cars looked awesome!